It’s been way too long. I haven’t posted anything since October 7th. And now I don’t know where to start. Do I backtrack and tell you a whole bunch of stuff you missed? That is such an overwhelming thought… and that’s why I haven’t posted anything. And the longer I wait, the more I have to report on! It’s a mad cycle, and if I don’t post something soon, I might just give up altogether….and then my sister would KILL me! Hmmm…so remember when I was going nuts trying to dye up enough yarn over the summer for the two fairs I was doing in the Fall? Well, I managed to dye up somewhere between 150-200 skeins. 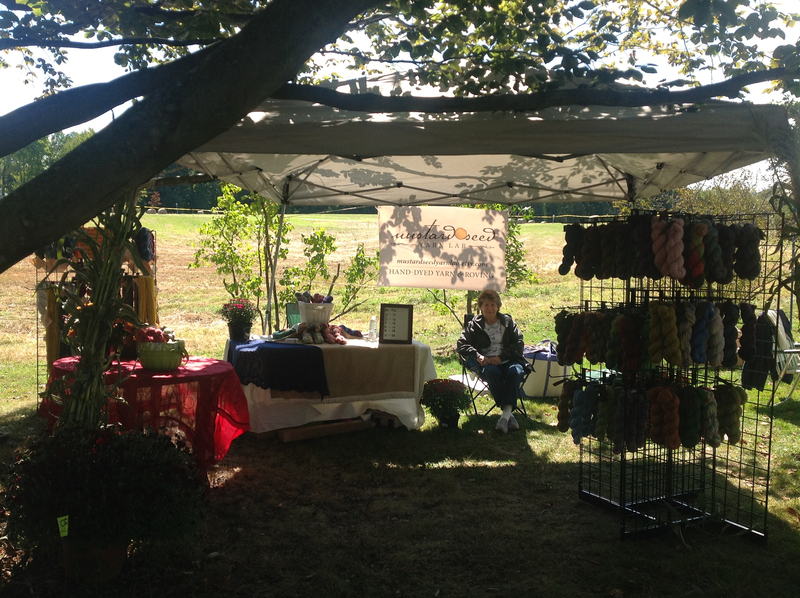 My booth was lovely…. ….but I only sold a couple skeins. Between the cost of the booth fee and the money spent on everything I needed to beautify my booth, I lost money. The same thing happened with my second fair…. …that’s my yarn on the right, and my sister’s yarn on the left. She shared each booth with me. I only sold a couple of skeins during the second fair too, leading me to believe that fairs are just not the venue to sell hand-dyed yarn. Not these types of fairs anyways. It was a lot of fun though. My mom was there hanging out with us and making friends left and right. My friend Vicki was there showing off her spinning skills and keeping the crowds entertained. And it was all a good experience…one that taught me that selling on Etsy makes way more sense for me than trying to sell in a fair. So there’s a little catch-up for ya. I think I’ll stop here and just do a little bit each upcoming post so as not to drown myself. Plus, I’m reading a really good book I can barely put down, and I’m itching to get in my jammies and go to bed and read. I highly recommend The Kitchen House by Kathleen Grissom. What’s on the needles right now….and not just mine. i’m sorry you didn’t sell more yarn – but thanks for the book recommendation! I needed one! By the way – that red yarn i was knitting with is AMAZING! Oh Breida, it’s a seriously good read. And I have ALWAYS wanted to buy some Malabrigo yarn…I’ve heard wonderful things about it. Someday…. I am so sorry that your lovely yarn didn’t sell very well at the fairs. I absolutely love the yarn I bought from you off your etsy site. I bet if you put it all up there it will sell very well! You dye gorgeous stuff! Maybe even a local yarn store would sell some of it too. Good luck! Awww…Spaceystacie you are very sweet! And I actually do sell my rovings in a local yarn shop but I decided not to sell my yarn there because they take a 30% commission and Etsy takes a much smaller amount. 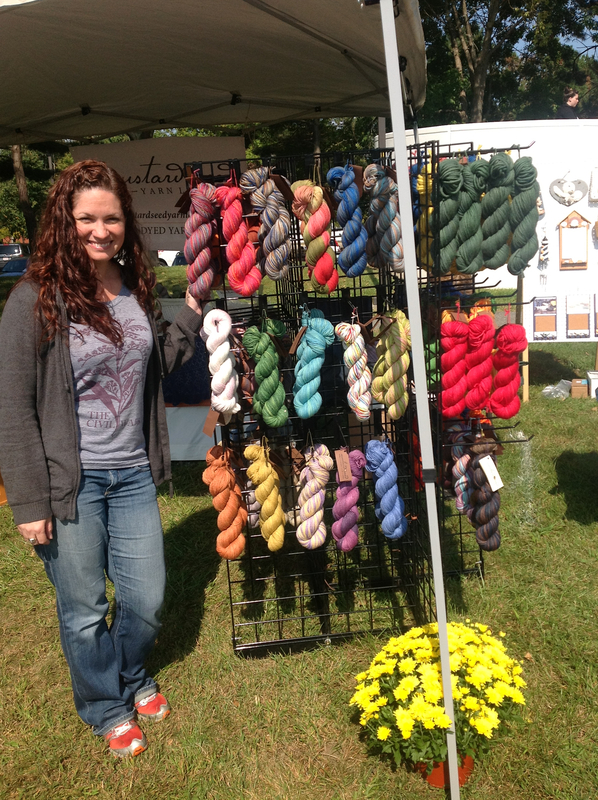 I’m so happy you love the yarn you bought from me…YAAAYYY!! And even though I didn’t sell any at the fairs, we really did have fun doing them, and it forced me to get all that yarn dyed, and my Etsy shop has benefitted from that! Thanks for commenting! You cannot – as long as I am blogging – stop your blog!!! It is a great blog!! Plus I love your yarns and they are stunning in their artistry and your photography is amazing and . . . . I love you Sis. 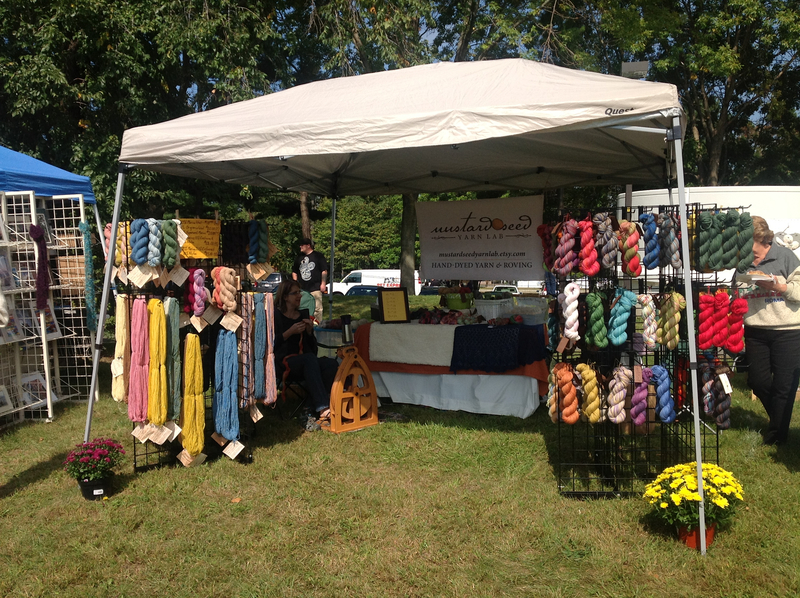 And the fairs were great even if only to give us time to play with yarn together. I keep wanting to knit up all of my stash yarns so I have an excuse to just knit with the yarns I dye. I have used up 2 skeins so far this month. Only 311 more to go!! Really, I am glad to see a post up. Thanks Shelly! And no worries, I don’t plan on stopping my blogging. I just need to get back in the habit of posting more regularly. Only 311 more….Hah! Love you too. Your booth looks amazing! I’ve been wondering about fairs and if spliting a booth with people would make sense – like a curated collection? And, I LOVED the Kitchen House! My bookclub read it last year. I’m glad you’re blogging – welcome back! Thank you Wendy! Yeah, it’s an awful lot of work to be in a fair, although it was fun. And I should finish the book tonight….I thought about putting up a post but the end of the book is calling me so I’m going to give in and read instead. Thanks for commenting!